Crafted in Spalted Tamarind with Natural finish. This amazing Spalted Tamarind is beautifully featured with our XL Dragon Sheath design. Our XL Dragon Sheath is made for simplicity and storage. 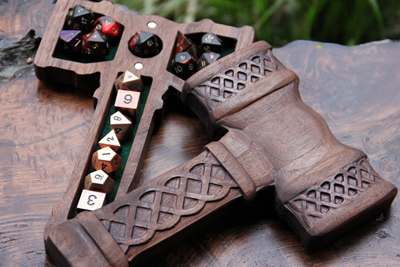 Holds approximately 30 dice. Double coated with a custom varnish for superb luster and protection.